In a food garden, nonchemical control of insects is an important advantage of Integrated Pest Management (IPM). Vegetable gardeners can discourage destructive insects and keep the beneficial ones through cultural practices, mechanical methods, and biological controls. Healthy plants are more resistant to insect infestation than unhealthy ones. 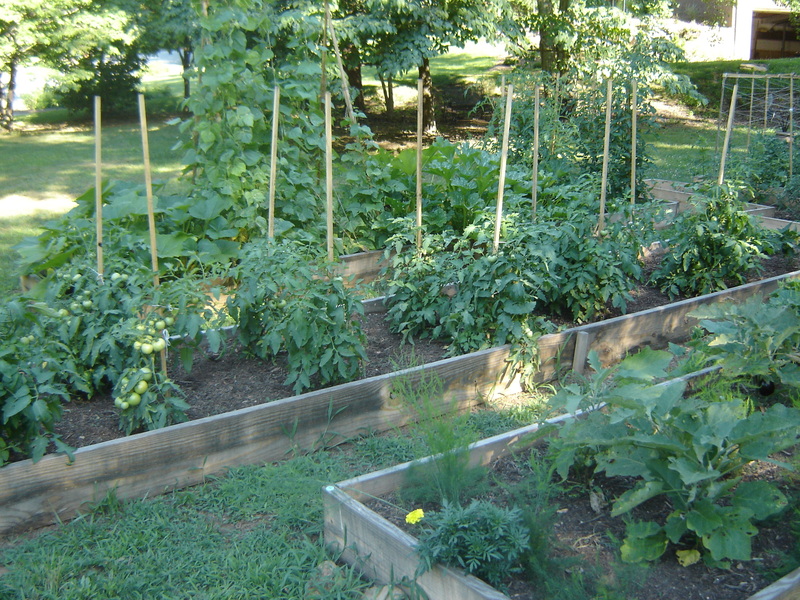 There are several practices gardeners can adopt to have healthier plants. Choose disease-free and insect-free seeds and seedlings. Be conscientious about soil preparation and maintenance. Rotate the position of your crops from year to year. Plant your seeds at the appropriate time for maximum growth, and thin seedlings and remove weeds to reduce competition. Discourage insects by interplanting different vegetables rather than attracting them to a large planting of a single crop. Add “trap” crops—plants attractive to specific insects—to lure destructive pests away where they can be removed or treated. For example, zinnias can attract Japanese beetles that might attack your corn or beans. Sticky yellow boards attract insects. Use traps, barriers, and handpicking to remove insects from your vegetable garden. Traps to try include yellow dish pans of soapy water to attract and drown aphids, yellow boards coated with oil or grease to attract and trap whiteflies and cucumber beetles, and shallow tins of beer set at soil level to trap slugs. Barriers can range from collars of cardboard or tin to discourage cutworms, to nets or screens covering seedlings to prevent insect and animal damage. 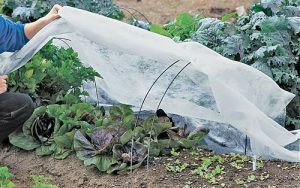 Fabric covers keep insects off plants. Physically removing insects or their eggs by hand is one of the most effective mechanical control methods. Drop pests into a jar with a small amount of water; finish the job by pouring in boiling water. 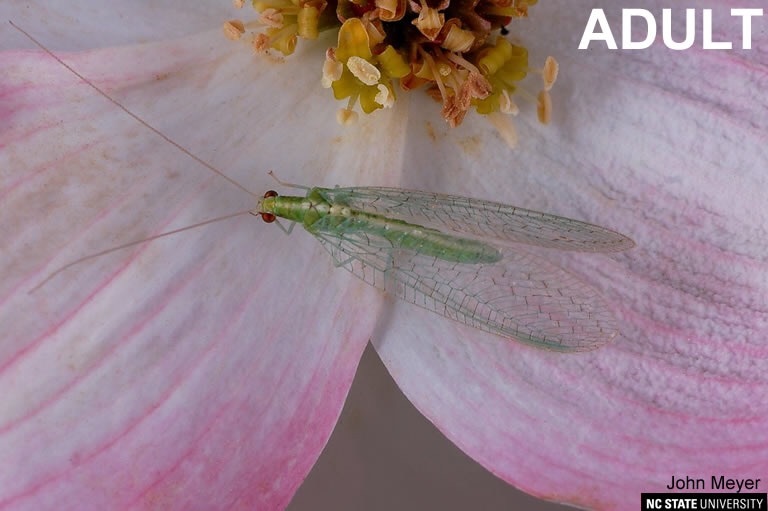 Spraying aphid- or spider mite-infested plants with a strong stream of water can go a long way toward reducing the insect population. Biological controls include using parasites, pathogens, and predators. Introduce natural parasites such as nematodes to your garden to kill vine borers, grubs, weevils, and armyworms. 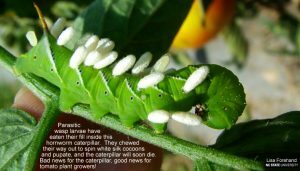 Or use pathogens such as bacteria (Bt—Bacillus thuringiensis) to kill caterpillars. These biological controls require an understanding of the life cycles of the parasites, pathogens, and insects. Insect predators to encourage in your vegetable garden can range from ladybeetles and spiders to birds and frogs. Including plants in your vegetable garden to provide a haven for predators will also attract pollinators, such as bees and butterflies. 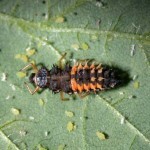 Assassin bug nymph feeds on potato beetle larva. 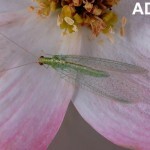 Larvae of the green lacewing feed on many pests. IPM mixes techniques to achieve results. Using all these methods in an Integrated Pest Management plan is just that: integrated. 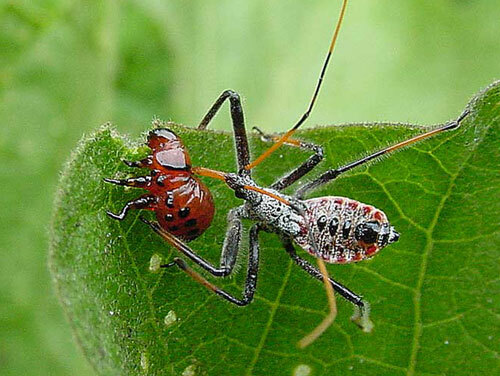 Removing all insects is neither desirable nor possible, but mixing cultural, mechanical, and biological methods helps control unwanted insects in the garden. Using this approach to vegetable gardening is a matter of common sense and conscientious effort. It’s IPM. Written by Mary Alice Ramsey, Extension Master Gardener Volunteer. Learn pest control methods for vegetable gardening in this two-part blog series on IPM. Part One explains IPM and outlines a multi-step process. Part Two identifies practical nonchemical ways to control insects. 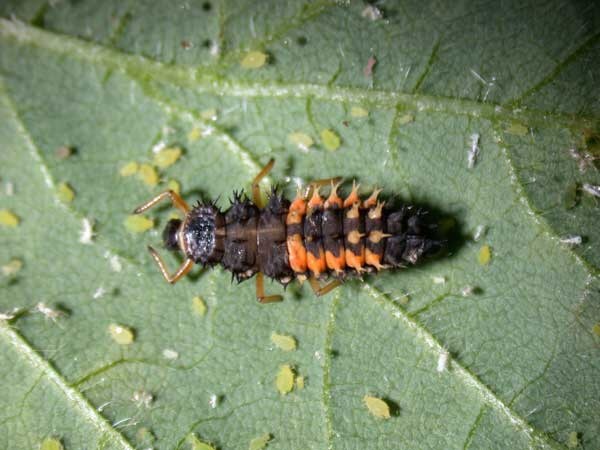 Rapid summer growth of your vegetable garden can lead to an invasion of pests. 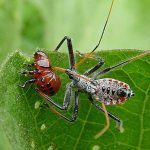 Although it is impossible—and inadvisable—to rid your garden of all insects, you can use a few different tactics to reduce damage from the six-legged critters. This combination of tactics is known as Integrated Pest Management or IPM. IPM combines the use of pesticides, cultural practices, and nonchemical methods to control pests. Beginning in the 1940s, increasing dependence on pesticide use for insect control caused problems such as pesticide-resistant insects, resurging insect populations, destruction of the pests’ natural enemies, damage to wildlife and water, and potential risks to humans. IPM can reduce or avoid some of these problems by combining insect-control methods instead of using pesticides alone. Adopt a multi-step IPM plan. Make an assessment. Survey your property, monitor insects, consider past pest control practices, and make a priority list of concerns. Create a good offense. Denying pests the environment they need to prosper interrupts their growth and reproduction cycle. For example, plant placement is important. Sun-loving vegetables need full sun. Avoid shady or damp areas where some insects might thrive. Keep your vegetable garden healthy through wise plant selection, placement, and care. Strong plants are less susceptible to insect invasion. Encourage beneficial insect predators in your vegetable garden. Some harmful insects have natural enemies that can provide partial control. Check vegetable plants often for infestation. Monitoring can help you catch insects as eggs or larvae before extensive damage takes place. Tolerate some plant injury. 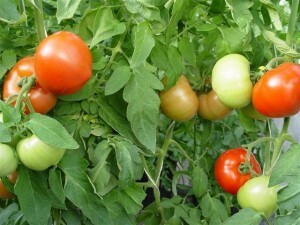 Minor insect damage will not prevent vegetable plants from producing a harvest. 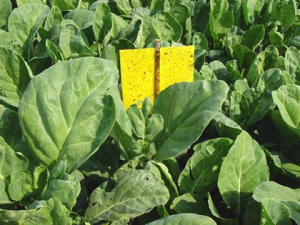 Evaluate your IPM approach as vegetables mature. Make changes as necessary. Parasitic wasp larvae attack hornworm caterpillar on tomato plant. Use pesticides as a last resort. Following the above IPM steps will help minimize pesticide use. If you do use pesticides, effective insect management requires identifying products that are suitable for food plants. Read the label to be sure the pesticide is effective for the insects you have identified. Use only the recommended concentration and timing specified. Wear protective clothing and be aware of potential environmental or personal dangers. Store pesticides properly and wash your hands after use. The payoff—good for you; good for the environment. Growing healthy plants that produce a beautiful and bountiful harvest is a vegetable gardener’s dream. Using IPM to encourage beneficial insects, discourage pests, and preserve human health and the environment can help realize that dream! This is the time of year to be putting your IPM into gear. But what is IPM anyway? Integrated Pest Management (IPM) is an economical, environmentally sensitive and effective way of dealing with pests in our gardens, whether they are bugs, blights or other bad news. Then came Rachel Carson whose Silent Spring brought the issue of pesticide safety to the attention of the public. She pointed to the adverse effects of things like DDT on wildlife, water quality, and human health. And, in the early 1950’s, that led to the beginning of serious research concerning integrating various approaches of managing pest control to find the least toxic, most effective options. We now know this as Integrated Pest Management or IPM. -A garden planned following the “right plant, right place” concept, whether it be ornamental or vegetable—considering sun, shade, soil pH, moisture, etc. – Regular inspection tours to identify changes, problems-in-the-making in our gardens. – Resources that are available to help us identify the culprit and our most appropriate alternative. -maintained records so that next year we have a “heads-up!” to help guide our plant choices and our surveys. When should we watch for what? Debbie Green will soon be posting a list of useful on-line references. 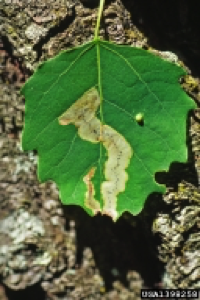 From time to time during the growing season our BLOG will be issuing IPM ALERTS—what to look for and what to do if you see it. Stay tuned!